The story of one family’s Obama barn in backwater Ohio illuminates America’s larger, progressive narrative & ideals. “Everyone’s a story,” my mother used to say. There’s always a story behind the story, too, but usually we don’t get it. 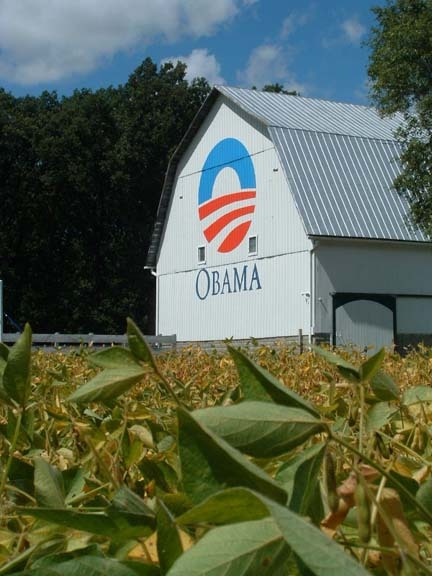 However, I know the history of this barn for Obama, only the second so painted in all of Ohio, because my wife’s a Krendl and the barn is on their family farm in the state’s northwestern corner. Theirs is a layered American tale with a heroic theme and its narrative flows ceaselessly out of the past. The patriarch, Adolph Krendl, made his way to the region around the turn of the century and went to work in a local brewery. Adolph was Austrian and had learned his craft as a boy in a monastery. He later roamed the world as a merchant seaman. His adventures ended when the Austrian military nabbed him for failure to report for compulsory service. In the army, he clashed with tyrannical officers and was sentenced to longer duty. He deserted one night after he beat a local bully and left him lying in the square. Another fistfight meant another extended hitch. Adolph fled to the U.S. and became a solid citizen of Delphos, Ohio—when he got together with the town’s priest and the butcher to talk and argue politics, people said “half the brains” in town were in that room. He spoke with an accent, was Catholic, progressive politically, and a self-educated working man. The region was a national stronghold of the then-mighty Ku Klux Klan, and there’s a story of a Klan thug threatening Adolph. He saw it was a time in America when the strong and the rich preyed openly upon the poor and weak. He wasn’t afraid, this guy whose body bore the scars of knife fights. Adolph married a local girl, Mary, the daughter of an immigrant German family, and they had two sons. When Prohibition shut down the Delphos brewery in 1920, Adolph bought the farm near Spencerville. Though the soil was fertile, he struggled—as the land’s first generation always does—and had to work shoveling coal too. Adolph’s and Mary’s son Karl remembered growing up hungry: eating bread smeared with lard and sprinkled with sugar was a rare treat. When Karl was eighteen, in 1934, he cut trees all winter to build the farm a proper barn, the fine gambrel structure now advertising Barack Obama. Karl Krendl stayed on the land. He worked in a steel foundry during World War II until he entered the navy and served in the Pacific. After the war he became a letter carrier and educated himself by reading The Encyclopedia Britannica. He and his wife, also named Mary, reared a son and five daughters. They led a bitter campaign to improve Spencerville’s schools, and one result was the first college testing: finally, local kids could attend schools other than Ohio State, which had open admission for Ohioans. In 1961 John F. Kennedy made Karl Spencerville’s postmaster. To the farm Karl added a small manufacturing business. His work was endless, but he finally got enough to eat. His and Mary’s children put themselves through college with the help of scholarships and from selling vegetables at their farm stand, a white clapboard shed beside the big barn. The Krendl kids became educators, a family doctor, and a guy who, before becoming a Harvard lawyer, served two tours of combat duty in Vietnam. “We’re just like any other farmers in Allen County, except we’re Democrats,” Karl and Mary’s fifth child, Kris, was quoted by The Lima News as saying in its story about the barn. Kris, an Obama volunteer, helped get the barn painted and took the photos here. At Obama’s rally in Dayton, he hugged two of Adolph’s great-grandkids, Leigh and Christopher. 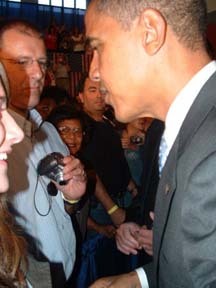 You can see Leigh talking with Obama in the photo above; that’s her dad, Dan, a schoolteacher in Spencerville, with the camera. Dan and his wife Karri, Karl and Mary’s sixth child, led opposition to a toxic waste dump planned for Spencerville. They helped mobilize a poor country village to assert itself; “Dump the Dump” was an uphill battle, with yellow ribbons and all, but they won. Now the area’s Obama float, Dan’s farm trailer pulled by his pickup, has had more people aboard it in parades than seemed to be cheering from the sidewalks in this Republican enclave. Love this story, and all of the many connections. On a Monday that’s been crazy busy, I clicked through to this, thinking I’d print it out and read it at home, but from the first graph I was hooked by a storyteller that knows how to “get them in the tent and keep them there,” as a former city editor put it. thanks, for reminding me that what I was doing was not all that important after all. A movingly authentic American vignette of the continuity of a certain kind of toughness transplanted into the Midwestern soil, taking root and flowering in these lives amongst us. Gives new meaning to “grass root” support. As a local boy also with some local history in the area, this was a great read. Being a friend of some of the family, I can say they are a class act.